SUMMER JAMBOREE the International Festival of music and culture of America &apos;40s and&apos; 50s. Gaynel Hodge, WS "Fluke" Holland, Kid Ramos, The Bellfuries, are the Big 4 coming directly from the US, the protagonists of the seventeenth edition of SUMMER JAMBOREE the International Festival of music and culture of America '40s and' 50s. "The Hottest Rockin 'Holiday on Earth" that includes two full weekends with nine days of intensive schedule. 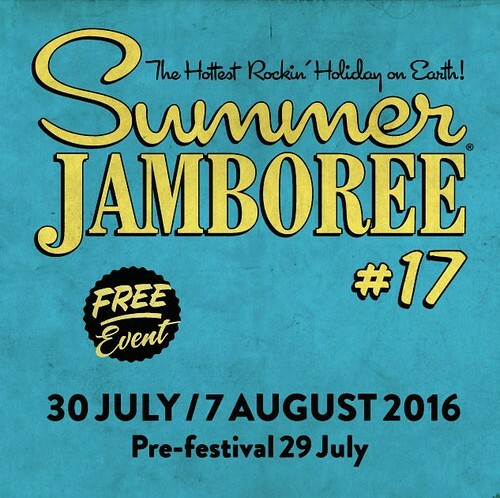 Featuring 39 concerts with free admission the seventeenth edition of the Summer Jamboree. 3 stages at the historical center, which will add the stages of HAWAIIAN BIG PARTY on the beach of Senigallia (Wednesday, August 3) from sunset to dawn with an unmissable program and the Teatro La Fenice for the hot night of Burlesque Show Friday, August 5. Each day will have its own special reason to declare himself with very great names that have made and make the history of Rock'n'Roll. Before and after all the concerts, as well as to "Dopofestival" at the Rotonda a Mare, dozens of DJs sets and other events from morning to night. A.N.G.E.L.O. permanent presence, also expect you this year with a wonderful selection.